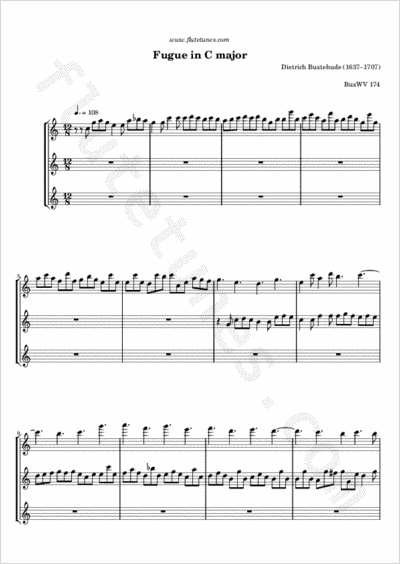 Following a request for some music by the German-Danish baroque composer Dietrich Buxtehude, we are posting one of his most popular compositions for organ, arranged for flute trio. For those who never heard of Buxtehude, he was one of the most important composers of the 17th century, and strongly influenced many younger composers of the period, including Johann Sebastian Bach. This jaunty Fugue in C Major has aptly been nicknamed the “Jig” Fugue. It has an extraordinarily long subject compared to other fugue subjects in Buxtehude's keyboard repertoire: it is six measures long in 12/8 time.